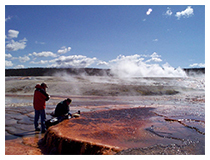 Astrobiology addresses three fundamental questions: How does life begin and develop? Does life exist elsewhere in the universe? What is the future of life on Earth and beyond? In our Geomicrobiology work group we address (parts of) these questions by combining fieldwork and laboratory experiments in organosedimentary microbial ecosystems. We use these as analogs for life on early Earth, and possibly in outer space. Microbial mats, especially those forming microbialites (lithified mats) are at the center of our work. These microbial ecosystems have dominated life on Earth dating back as far as 3.5 billion years. Together with colleagues from Argentine, Australia, Chile, France, and Sweden, we investigate mechanisms of biosignature formation. These biosignatures are either (metabolic) gases or minerals, and are formed during the combined cycling of C and O, S, Se or As. We work in hard water lakes (Green Lake, NY); open marine environments (Highborne Cay, Bahamas); and hypersaline lakes (in the US, Argentina, Chile, Australia, and the Bahamas), some at sea level, others > 15,000 ft above sea level. Key microbialites under investigation include layered stromatolites and clotted thrombolites. We are involved with the conservation of microbial ecosystems (Big Pond, Bahamas; Lake Clifton and Lake Richmond, Shark Bay, Australia; Laguna Brava and Laguna Tebenquiche, Chile) and the discovery of sub-salt oil reservoirs, which has led to collaborations with Petrobras (Brazil). We also collaborate with colleagues at Woods Hole Oceanographic Institution on protist distribution and biogeochemistry in deep ocean trenches (Santa Barbara basin; Mediterranean brine anoxic basins). Edgcomb, V.P., J.M. Bernhard, R.E. Summons, W. Orsi, D. Beaudoin, P.T. Visscher. 2014. Active eukaryotes in microbialites from Highborne Cay, Bahamas and Hamelin Pool (Shark Bay), Australia. ISME J 8:418-429. Dupraz, C., R.P. Reid, O. Braissant, A.W. Decho, R.S. Norman, P.T. Visscher. 2009. 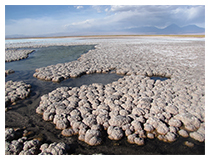 Processes of Carbonate Precipitation in Modern Microbial Mats. Earth-Science Reviews 96:141-162. Visscher, P.T., J. Stolz. 2005. Microbial communities as biogeochemical reactors. Palaeogeography Palaeoclimatology Palaeoecology, 219:87-100. Dupraz, C., P.T. Visscher. 2005. Microbial lithification in modern marine stromatolites and hypersaline mats. Trends in Microbiology 13:429-438. Reid, R.P., P.T. Visscher, A.W. Decho, J. Stolz, B.M. Bebout, I.G. Macintyre, H.W. Paerl, J.L. Pinckney, L. Prufert-Bebout, T.F. Steppe, D.J. Des Marais. 2000. The role of microbes in the accretion, lamination and early lithification of modern marine stromatolites. Nature 406:989-992. Visscher, P.T., R.P. Reid, B.M. Bebout. 2000. Microscale observation of sulfate reduction: Evidence of microbial activity forming lithified micritic laminae in modern marine stromatolites. Geology 28:919-922.